Nine-year-old Priyanka Kumari wants to escape her impoverished childhood but the school she studies in is most unusual – underneath a metro bridge in east Delhi’s Shakarpur area. The pillars serve as the boundary of the school and trains roar past on the bridge above, rattling her as she solves elementary mathematical problems. 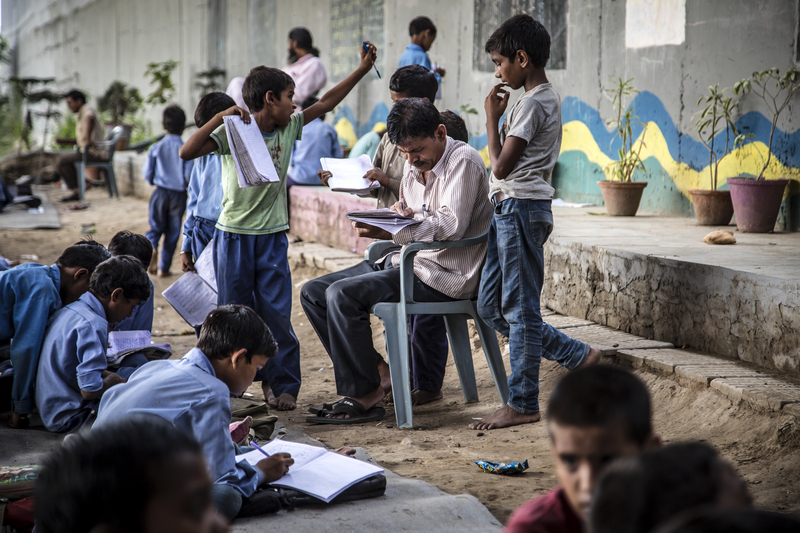 Rajesh Kumar Sharma, a grocery store owner in Delhi’s Shakarpur area, has been teaching poor children in his open-air free school under a Delhi Metro bridge near the Yamuna Bank Metro depot for the last five years. “The teaching here is good, I like coming to this school. Sir gives work to do and then checks it and tells us where we went wrong,” she says. But things have changed since Sharma – who runs a grocery store in the neighbourhood – found international limelight in 2011, when a flurry of newspapers worldwide splashed photos of his brainchild. 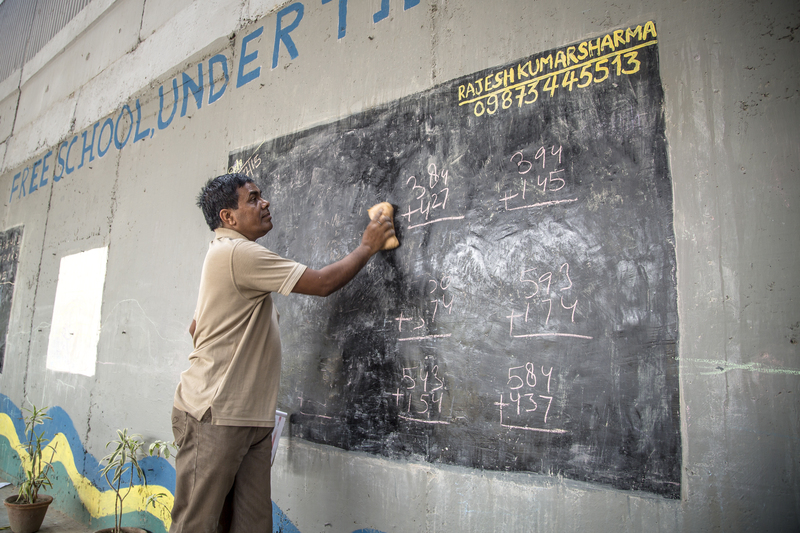 Shyam Mehto, a volunteer teacher at the Free School, teaches mathematics to the students. The school is no longer skeletal and children have painted behind the elevated platform used by teachers in lively colours. The place is cleaned regularly and well-wishers have contributed chairs and a toilet to be used by female students. The number of students has also grown – from 50-odd in 2010 to around 200 now. “I rode a horse once and I think I can pass the physical tests. But for the written round, I need guidance and have to study,” says Pintu. Priyanka and Pintu aren’t the only ones. Hundreds of children born to migrant workers, labourers, rickshaw-pullers and famers who live in shacks and hutments with poverty and widespread illiteracy keeping them out of school. 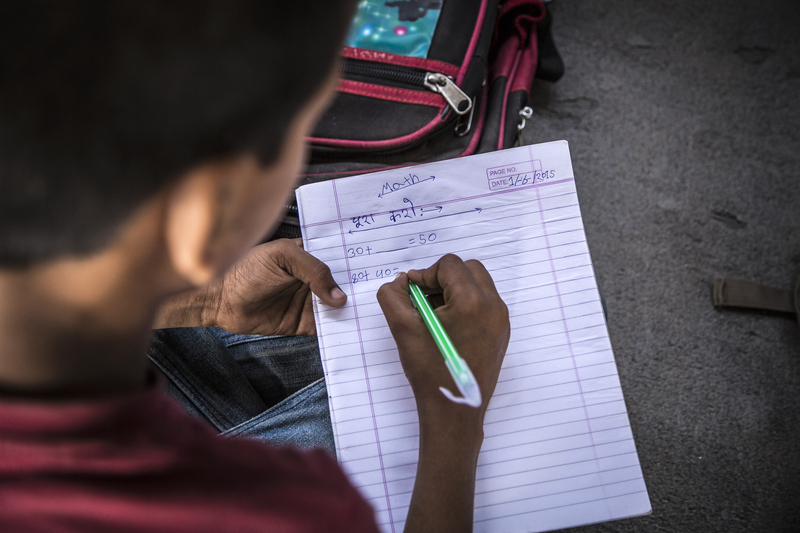 Most of the students who attend the Free School are born to migrant workers, labourers, rickshaw-pullers and farmers who live in shacks and hutments in the villages by the Yamuna. Most students are registered in nearby government-run schools, but attend Free School’s classes because the teaching helps them understand formal syllabi. Moreover, they don’t have to pay any money. “In the Free School, we are assisted in completing our homework and understand what we were taught at school. Also, the time I spend here would have been otherwise wasted in roaming around or gossiping. The school is of great help” says Pintu. Sharma, however, is not bothered by comparisons with government-run schools. 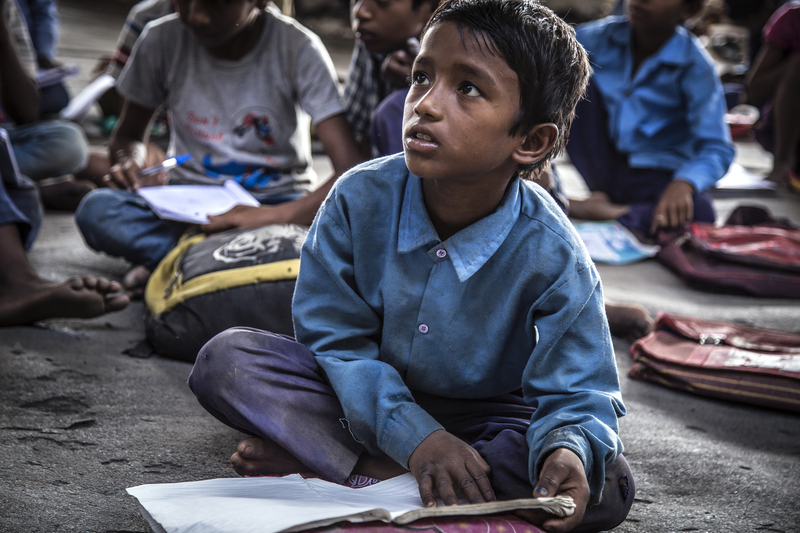 Many students in the school are registered in the nearby government-run schools, but they attend Free School’s classes because they are taught better here. “I just believe I have to give my best in teaching these children because otherwise they will become part of a generation lost due to poverty. Moreover, I encourage them to get enrolled in government schools so that they can avail some benefits,” he says. Classes start at 9am every day, beginning with a lesson or two in physical training, and continue till 12 noon, after which the boys’ shift starts at government schools. The girls’ shift, however, is in the morning and hence they can’t attend the Free School classes other than holidays. Hence Sharma is thinking of starting a girl’s only batch at 2pm, after they return from their schools. But some children, like Shivani Kumari (10), say the only complain they have is that government schools provide a proper lunch but here it’s mostly only biscuits. Earlier this year, with financial support from well-wishers and non-government organisations, the school bought a ready-made toilet for girl students. 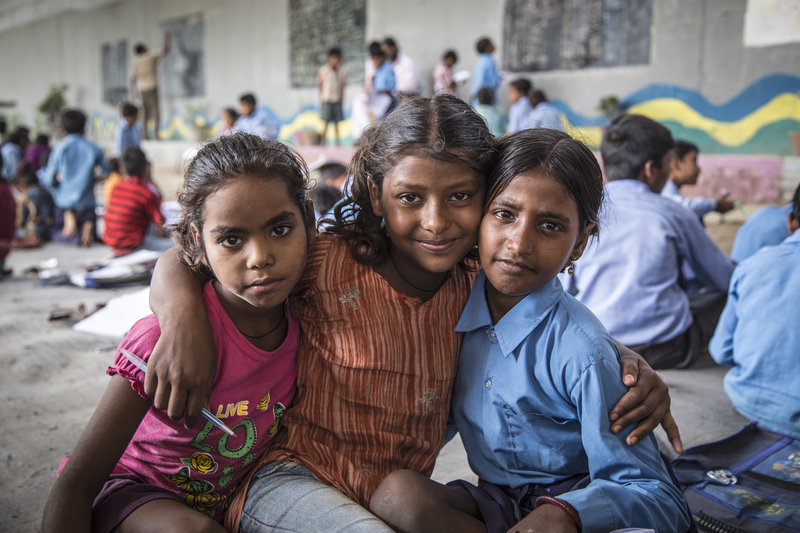 Students of the Free School, Babita (left), Shivani Kumari (centre) and Priyanka Kumari (right) pose for a photograph. Going back in time, Sharma says an unfulfilled dream of becoming an engineer led him to start the school. “Back in the 1989, I had to drop out after the first year of college in Aligarh due to worsening financial condition of my family. When I passed out of class 12 in the science stream, I too dreamt of becoming an engineer. That unfulfilled dream has turned into this school,” he says. 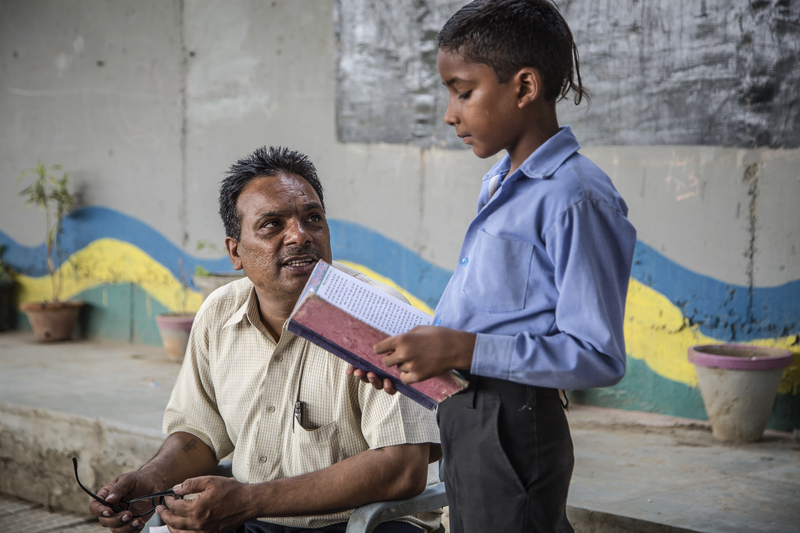 Laxmi Chandra, a tuition teacher from Bihar, joined Sharma in 2011. A native of Bihar’s Nalanda district, Chandra is the son of daily-wage labourers and a science graduate from Bihar’s Magadh University. While Sharma teaches basic Hindi and English, Chandra focuses on mathematics for high-school students. Before taking a class, Laxmi Chandra wipes the blackboard, which is painted on the Metro Depot’s wall. “In Bihar, I have seen many young boys and girls get pulled into Naxalism, because they knew no other way to think about a better system. There was perhaps a lack in their education. 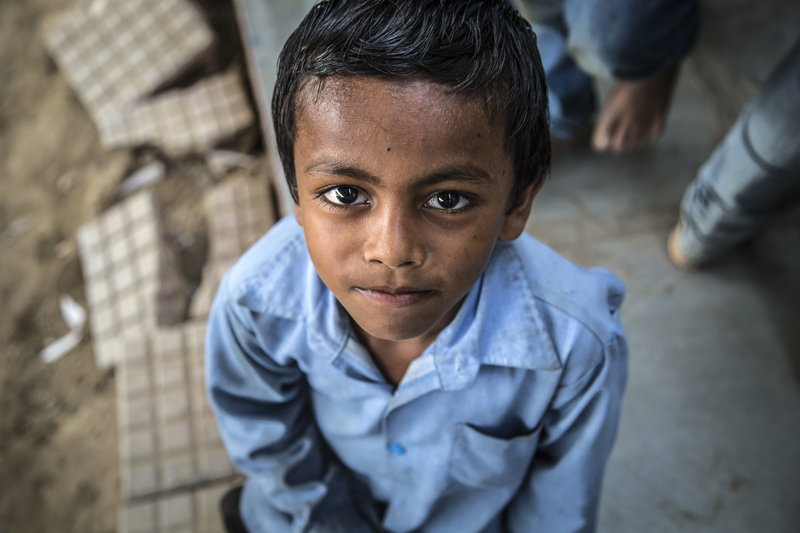 Today, when I see Delhi’s poor children, I feel they must be guided and educated,” says Chandra. Classes start at 9am every day, beginning with a lesson or two in physical training, and continue till 12 noon. 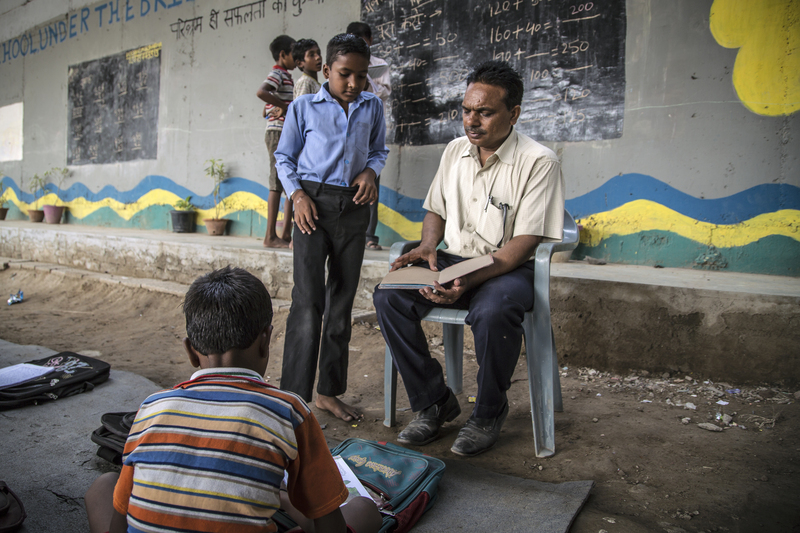 A third teacher, Shyam Mehto, a part-time tuition teacher from Bihar, joined the school last year and teaches elementary mathematics. However, running a social-welfare endeavour has its own issues. Sharma says several individuals and organisations have tried joining him for short phases and publicise themselves. People, he says, have tried to hog the limelight without putting in any effort.